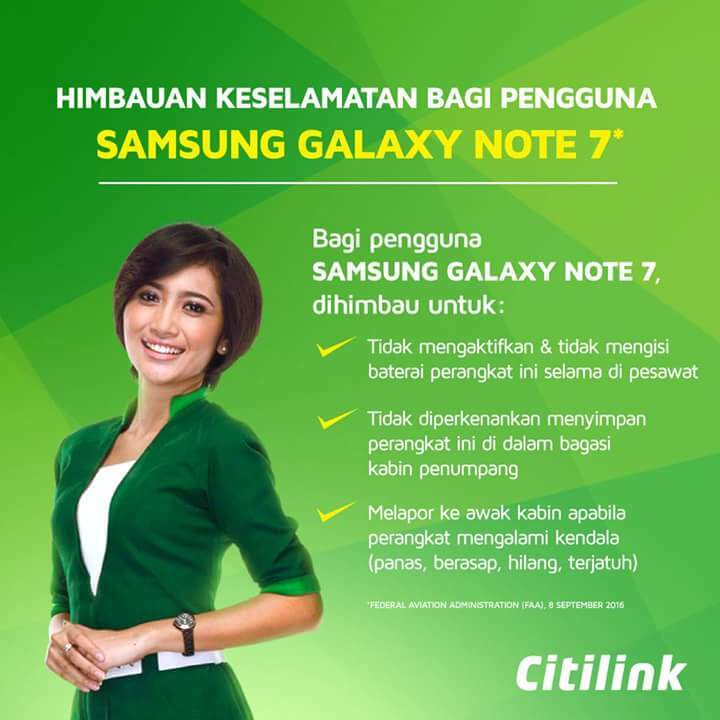 Did Citilink just told people to put Galaxy Note 7 in checked baggage? With all the attention given to the Galaxy Note 7, advisories regarding its handling for airlines require advisories that are clear and consistent for the sake of safety. 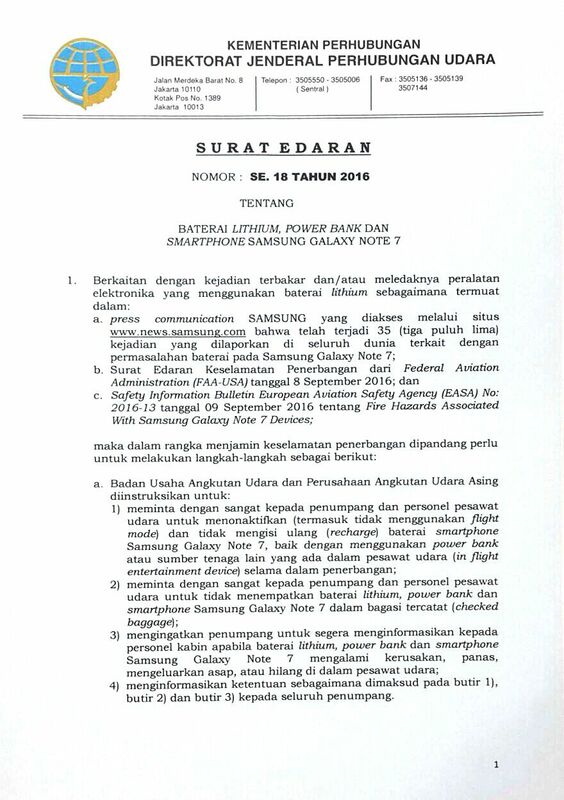 Many Indonesian airlines have issued advisories/guidelines/rules regarding the Galaxy Note 7, and are mostly clear and consistent. However, this morning I was shocked when someone sent me the following picture, that includes a fatal error. Do not activate and/or charge the battery of the device while on board the aircraft. Report to the crew when when you have problems with the device (excessive heat, smoke, missing, fallen from your seat). where is the problem? The use of the phrase “baggage in the cabin” in English is clear enough, but in Indonesian the context can be ambiguous as it means I am not allowed to stow it in a bag in the cabin, which means I have to carry it with me, or it gets stowed in my baggage that is not in the passenger cabin (ie: checked baggage that goes in the hold). So if the FAA tells people to not stow them in any checked baggage, why does Citilink tell people to not stow it in the cabin (which means stowing it in the luggage hold if you’re not carrying the phone)? Demi menjaga keselamatan dan keamanan penerbangan bersama Citilink Indonesia mengimbau kepada seluruh penumpang untuk menonaktifkan seluruh peralatan elektronik, terutama Samsung Galaxy Note 7, dan tidak melakukan pengisian baterai selama penerbangan, serta tidak memasukkannya ke dalam bagasi. 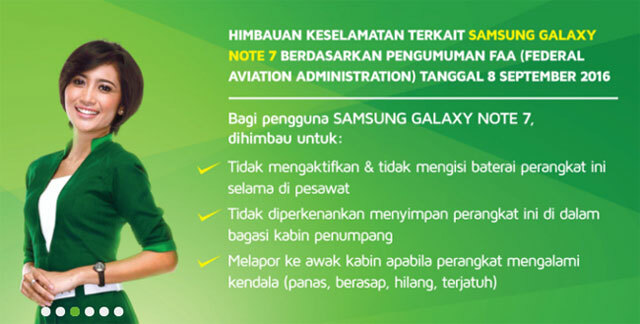 In the interest of safety and security, Citilink Indonesia advises passengers to switch off all eletronic devices, especially the Samsung Galaxy Note 7, and to not charge batteries, during flight, and to not stow them in your baggage. Baggage, in the absence of other words, normally means, checked baggage. So now we have conflicting advisories on the SAME WEBPAGE! 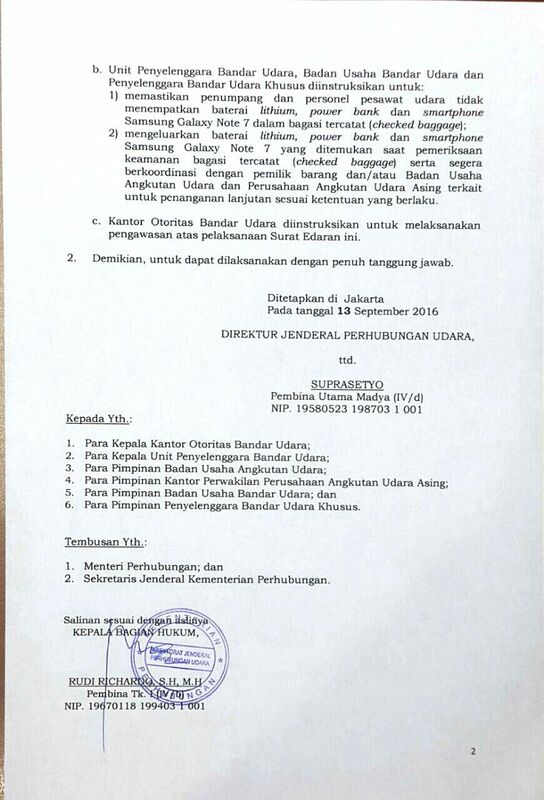 For those interested, the Directorate General of Civil Aviation (DGCA) issued a circular on the first working day after the FAA statement (the Monday being the Eid-Al-Adha holiday), which, while in Indonesian, stated correctly that lithium batteries, power banks, and Samsung Galaxy Note 7, should not be stowed in checked luggage. There is no ambiguity in the circular. 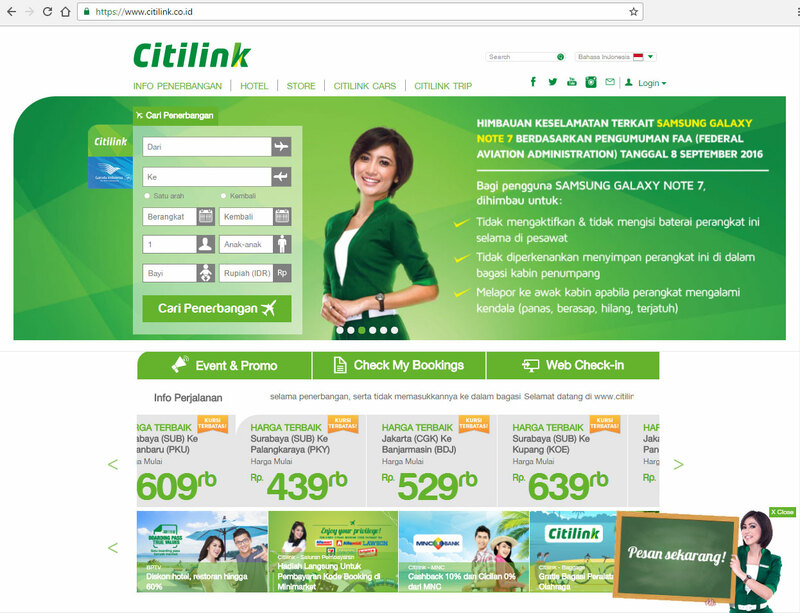 However, the erroneous version issued by Citilink only started appearing today (27 September). Surely it would be better for Citilink to refer to the DGCA circular which is not in error rather than mistranslating the FAA statement. It would be wise for Citilink to expeditiously remove all erroneous advisories on this matter to prevent misunderstandings out on the field that could have fatal consequences, and to replace them with correct, consistent, and unambigious revised advisory, as soon as possible. Pertanyaan saya sekarang adalah akankah himbauan Citilink tersebut diubah agar selaras dengan surat edaran Kementerian Perhubungan dan FAA? Menurut saya, kalau mengutip himbauan FAA saja tidak benar, sebaiknya dasar acuan himbauan maskapai ini diubah dari FAA ke Kemenhub daripada bikin bingung dan mungkin malah malu²in. Yang pasti himbauan yang ambigu dan berpotensi mengakibatkan kesalahan fatal dilapangan, harus diganti dengan yang konsisten dan tidak ambigu secepatnya!